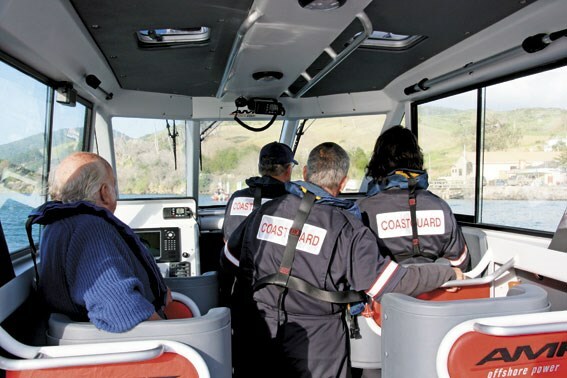 When the Hokianga Volunteer Coastguard went looking for a new boat, it needed something well above the usual standard to deal with a fearsome operational area. Hokianga Harbour's notorious bar has a nationwide reputation as a seriously mean mother. The Northwest Reef located in the harbour mouth comes to within 2.5m of the surface and creates waves which often exceed 5m. But just inside the south head, the water can be 40m deep. As a result, the bar can only be crossed about 100 days of the year and is best tackled at the top of the tide. The existing Naiad 6.8m alloy boat with twin 130hp, four-stroke Hondas had served the crews well for many years, but it was simply too small. In extreme conditions it struggled to get over the bar, and lacked the necessary grunt to make the journey safely. The recent trend towards bigger recreational boats also meant it was often unable to safely tow a stricken vessel. Limited capacity for treating or conveying injured persons was another drawback. The search for a new vessel has been comprehensive, with the committee evaluating offerings from a number of vendors. Stability, comfort, speed, range, reliability, fuel economy, support and price were all criteria to be considered. In the end the proposal from Mt Maunganui's AMF Boat Company Ltd came out tops. According to Jeff Cramp, president of the Hokianga Volunteer Coastguard unit, the AMF QRV 950 suited their requirements perfectly. Although not the cheapest option, the 9.5m AMF is big enough to handle the bar in most conditions. 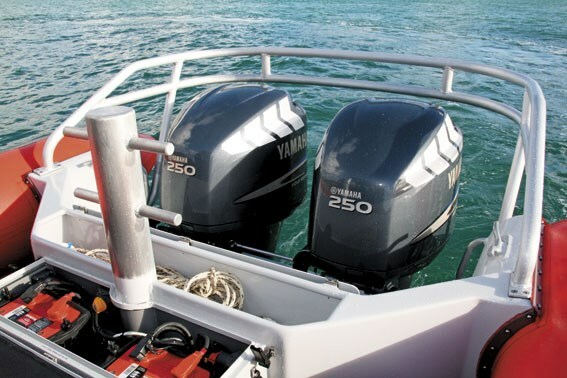 Powered by twin Yamaha 250hp four-stroke outboards, this boat can handle everything they are likely to encounter, with power to spare. Cramp says a twin engine rig was an absolute requirement given the consequences of engine failure during a bar crossing, and the proven reliability of the Yamahas was a bonus. 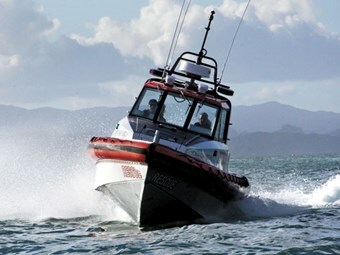 AMF Offshore Power is the custom-build division of AMF boats, with its production boat facility located in Wanganui. The QRV (Quick Response Vessel) range features RIB-style aluminium hulled boats which have been developed for the rescue industry. The heavy duty Hypalon tubes fitted around the boat form no part of the basic hull and are there for stability and safety when coming alongside other vessels. The hull bottom is 8mm aluminium plate with the sides being built of 6mm plate. Armoured windows are fitted (with wipers) and soundproofing is an integral part of the hull. These boats are pushed to limits not normally encountered by a recreational vessel, so everything is over-engineered. The sturdy towing pylon is welded directly to the hull, and double rails keep tow ropes clear of the motors. Under operational conditions the boat may take water over the transom, so the cockpit is fully self-draining. All storage areas have heavy-duty covers to keep gear in and water out, and the batteries are located high and are easily accessible. All emergency gear is well secured so it won't come adrift in rough seas. The boat has a 527-litre underfloor fuel tank which provides ample range for the operational area from Maunganui Bluff to the Ahipara Banks. But because the Hokianga crew is currently the only coastguard unit between the Northern Kaipara and Cape Reinga, it may be called on to respond to incidents within the wider area. At full throttle the boat reaches speeds in excess of 50 knots – not bad for a 3.5-tonne vessel. Of course, the engines are thirsty at this speed, so operational speeds are generally considerably lower. Since operating expenses for the coastguard are covered by donations, the crew is cognisant of not burning up unnecessary fuel. But it's comforting to know that the speed is there when needed. Interestingly, the interior of the vessel does not have any seats for the crew. Instead, they stand in curved back braces with multiple grab handles, allowing them to travel while standing upright. This is the best way to handle extreme conditions at speed without causing injury. The forward cabin has two full-length bunks, and has extensive padding on the interior surfaces. These can be used for carrying an injured person, although only if conditions allow. A vast, reinforced forward hatch allows safe access to the anchor locker and forward bollard from within the boat. This hatch folds completely flat and the person in the bow has a secure position to work from. The boat is fitted with everything that could be asked for in electronics. A Simrad CX44 Navstation with 10.4-inch colour display is installed for the observer, with an identical DS44 repeater display at the helm. This unit includes radar, GPS, chart plotter and sounder, and features a night vision mode. VHF radio, searchlights (as well as warning lights) are installed. Interior lights are fitted with red bulbs to preserve night-vision, allowing the crew to function inside the cockpit while still being able to see what is happening outside. 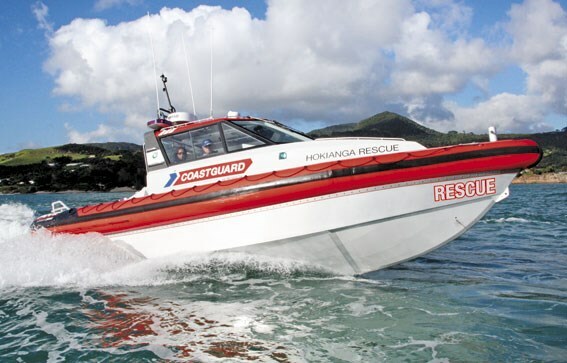 Hokianga Rescue was delivered early in May and we were invited to go out on one of the Coastguard's training sessions. The unit has 16 'wet' volunteers, with a further dozen or more admin people who help out regularly. They train every two weeks, regardless of weather or conditions, and also provide support at local water-based events such as fishing competitions, harbour swims and waka racing. Cramp says they regularly train at night, including practising the recovery of people in the water. After some exciting runs through the surf on both the old and new boats, the benefit of the AMF was immediately apparent. Thanks to its greater length and beam, the new boat powers through waves that stopped the smaller boat in its tracks. The 500hp from the big Yamahas let the boat accelerate uphill through the front of big waves – quite an interesting experience! Cramp says that the engines are capable of over-revving the current props, but they have selected them in order to get best low-speed power and acceleration. Coming off the back of some of the waves we found that the big AMF is remarkably soft-riding. Even when dropping half its length back into a trough, we experienced none of the heart-stopping crash most boats would exhibit. The crew said they have taken some big waves beam-on to see how it handles them, and the expansive pontoons ensure that the boat's almost impossible to roll. Once we had got the dramatic stuff out the way we moved back into calmer waters. The boat is fitted with power steering to control the big engines, and the crew commented on how easy the boat was to drive with one hand. The controls for the twin Yamahas are also well placed, since driving in wild conditions requires one hand on the throttle and one on the wheel. Coming back into the wharf at Opononi gave us a chance to check the boat's manoeuvrability. Thanks to counter-rotating props there is no prop-walk at low speeds, and the boat turns in very easily. The boat is supplied on a custom-built heavy duty aluminium trailer, also built by AMF. This dual-axle braked trailer requires a special permit to tow as the boat is over-width, but the Coastguard's Land Cruiser has no difficulties with towing and launching it. Chatting to Jeff Cramp over a cup of coffee after the session on the water revealed that he is not only president of the Hokianga Coastguard, but is also their Chief Training Officer and Senior Master. Added to this is his day job as Officer in Charge of the Rawene police station, and clearly this is a man with serious responsibilities. Since joining the Coastguard in 1996 he has personally participated in more than 100 rescues. Since marine search and rescue incidents are coordinated by the police in the first instance, his role makes perfect sense. Cramp says that the main problems they face involve people with boats too small for the conditions. Capsized boats in the bar are the disaster they deal with most often, with occasional yachts and offshore fishing boats requiring assistance. A large number of kayak and outrigger canoes use the inner harbour and these also occasionally get into difficulties. Although the bulk of the funding for the new boat came from grant money from the ASB Community Trust and the Pub Charities board, a considerable amount of local fundraising was needed. The unit's older 6.8m Naiad boat will shortly be sold, hopefully to another Coastguard unit, to make up a further shortfall of the purchase cost as well as cover some running expenses of the new boat. For the immediate present it will be used by Whangaruru Coastguard while its boat undergoes an overhaul. This is the third QRV 950 that AMF has supplied to a Coastguard unit. The North Shore unit took delivery of its boat earlier this year and Tutukaka is due to receive one shortly. Although that boat was not included in the Hokianga unit's selection process, the fact that two Coastguard units have independently selected this boat as their craft of choice speaks volumes about it's suitability to purpose. A QRV 900, powered by a Yanmar 440hp Diesel and a Hamilton 274 jet, was also delivered to the Tirua-Pauanui community Coastguard last year.